To share with the world the spiritual knowledge of the ancient Maya as it is found in their ceremonies, temples, pyramids, elders, shamans, priests and priestesses, healers, ancient books, stele, pottery and oral traditions. offering ancient Maya teachings through journeys and workshops since 2004. 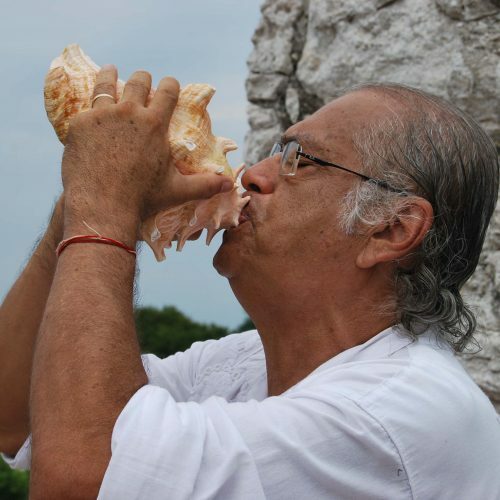 Miguel Angel is a Maya Priest and Master Teacher who lives and works in Yucatán, Mexico. He studied with Maya Elder Vin- cente Martín for 17 years and continues to work with the Elders and Priests who are keeping the Maya Sacred Wisdom very much alive today. He teaches us how to connect with the Maya Masters of Light who are still at the sacred sites ready to guide us today as in ancient times. Going to the source of the Maya knowledge: to the ceremonies, rituals, mantras, sacred books, pyramids, temples, stele, pottery, paintings, sculptures, and oral tradi- tions that are available today, he finds the essence of their knowledge and then teaches it in a heart-centered style that connects rapidly and profoundly with his students. Originally from Canada, Trudy has made Mérida, Yucatán her home since 2001. More than 20 years earlier while sitting on the top of the KuKuulKaan pyramid at Chichen Itza she heard a voice tell her that she would return and learn all about the Maya. When the time was right, after many life lessons and many visits to Mexico, she made the move. Wanting to learn more about the ancient culture, not finding tours or programs that helped connect with the essence of the Maya in meaningful ways, and believing others felt the same, she created Iluminado Tours. Then, as if by magic, her teachers appeared. Miguel Angel Vergara opened the door to the spiritual knowledge of the Maya and her mission in life came into focus. Freddy Silva is a best-selling author, and a leading researcher of ancient civilizations, restricted history, sacred sites and their interaction with consciousness. He is also a leading expert on crop circles. His books have been published in five languages. Described by one CEO as ``perhaps the best metaphysical speaker in the world right now,” for two decades he has been an international keynote speaker, with notable appearances at the International Science and Consciousness Conference, the International Society For The Study Of Subtle Energies & Energy Medicine, and the Association for Research and Enlightenment, in addition to The History Channel, BBC, GAIA TV, and radio shows such as Coast To Coast. He is also a documentary filmmaker, art photographer, and leads tours to sacred sites in Mexico, Guatemala, Egypt, Peru and Bolivia with Sacred Earth Journeys.